This post is part of the April synchroblog, the Resurrection Hoax. It is adapted from a prior post I wrote in 2010. Many people emphasize the importance of the resurrection in their theology. They have said that if Christ did not rise from the tomb, their whole faith would be lost. Honestly, I don't really understand this. Is the resurrection central to Christianity? Of course. Is it a defining variable? I'm not so sure. It's distinctive, but how different is Christianity from ancient, pre-Christ Judaism? In specific practices and culture, it's of course different. And people could argue a focus on the law. However, a focus on the law was really within certain Jewish traditions. And there's plenty of Christian traditions that focus on the law just as much. In my studies, I have seen a rich and vital faith in ancient (and modern) Judaism that really connects with God, seeing God transforming lives. God is involved in the present, changing lives now. However, that is often not as emphasized in a lot of modern Judaism. There is a big trend of seeing God less involved. That is a power of Christ--Christ came to bring life. Not just in the future, but now. When we forget about the now, we only focus on life in the future (i.e. eternity). And if there is no resurrection, then of course we should be afraid of our life after death. However, when we see our faith and experience with God transcending more than just death, then we can value many more things than just the resurrection. One of the interesting questions the synchroblog provided as a possible prompt was what religion (if any) would you be a part of if the resurrection did not occur. I believe I would still be a follower of Christ because his teachings are true. Further, considering options for epistemology, my experience and what I would interpret as my relationship with God (and each person of the Trinity) reinforces my faith. Therefore, ultimately, a lack of the resurrection would have to change the way I understand Christ, but not necessarily the way I love him. I don't think the resurrection made the disciples love Jesus any more or any less. They probably cognitively understood him better (or simply acknowledged the awesome mystery). And I think one of the primary effects of the resurrection was God having the final word in dramatic fashion. But even if he didn't take the final word, that doesn't make him less powerful or less God. "...a lack of the resurrection would have to change the way I understand Christ, but not necessarily the way I love him." so true! And Christ is risen indeed!!! What about what Paul says in 1st Corinthians 15? That if Christ isn't raised from the dead his (Paul's) preaching is useless and so is our faith (vs 14)? If Christ wasn't raised he was a liar and so were the disciples. You said you'd still follow because his words were truth...I'm a little confused on that part i guess. If Christ wasn't raised from the dead, then parts of the Bible are necessarily untrue and would have been later additions. In that case, perhaps Paul was wrong or perhaps someone added those statements. Believing in the resurrection makes everything congruent, though. This post is more with regards to a hypothetical situation. Additionally, some of my point, too, is that the disciples loved Jesus deeply far before he died and was resurrected. And it's pretty clear they did not all comprehend him as a member of the Trinity. The resurrection helped solidify his identity as God (although again hypothetically, I think he could still be God without the resurrection). The problem I have with that answer is that is still doesn't account for Christ being a list and also dead which in that car we are also dead in our sins. Because if Christ wasn't raised to life neither are we and so more than just the next life we remain dead in this one also this seeks to be what Paul it's referring when he's talking to the church in Corinth, some were saying there is no resurrection at all. So without the resurrection there is no new life just death. That means for this one and the next. Also it'd just show Christ as a liar and just a man who did not tell i the truth and even a good leader isn't a liar. Thanks for your response, Mark, although I don't agree with your conclusions. A spiritual resurrection of Jesus is still possible. I really appreciated you pointing out that our love for Jesus (which I believe results from the way he loves) is what really draws us to him and compels us to follow him and that you have no reason to believe that the disciples loved him "more" because of the resurrection. I appreciate it because I don't know that I do believe in the physical resurrection of Jesus although I once did and yet my faith in Jesus, my commitment to following him has not diminished now that I am not so sure. I don't follow Jesus because he was resurrected and I don't follow him so I can get into heaven when I die. I follow Jesus because I love him and believe in his way. Hi, Liz and river song! Thanks so much for both of your eloquent comments! I'm with Markchop here: if there is no resurrection then there is no Christianity according to Paul. We followers of this empty faith should be the most pitied of all men. It comes down to this: if we cannot trust the Bible on Jesus' resurrection, then how could we possibly trust any of the other parts? How could we trust a relationship that we may or may not have with God if we throw out the Word? We lose the God you are referring to. We lose the Christ you are talking about. We lose the Trinity described in the Bible. We lose all the teachings. All we would be left with would be ambiguous feelings. In fact that is exactly what those who say that they are "spiritual" but not Christian have. Respectfully, there is no Christianity or truth without the Bible because that is where the truth is derived from, and there can be no trust in the Bible if we cannot trust what it says about the resurrection. Thanks for your comment. As I stated in the original post, our theology would have to change if the resurrection did not occur. The purpose of this synchroblog was to take the hypothetical situation of the resurrection not occurring. How then would we handle faith? Truth is not only derived from the Bible, but from reason, revelation, experiences, etc. The Bible provides a common language and central source that people agree upon. However, we have to be careful and not move into bibliotry. We also need to be careful and not always have to have everything known and proven beyond a shadow of a doubt. At that point in time, we have lost faith. Finally, we also need to remember that there was no Bible for several hundred years. Until the last few centuries, most people were illiterate and therefore could not rely on the Bible. I love the Bible and consider it to be authoritative and inspired by God. However, we also need to recognize that it is not everything. The lie that people tell that past people groups were illiterate is not an accurate history. Jews both genders went to school to learn to read and to write. While education may have stopped at eight they still got the training. They may not have had a bible or Torah in every house but they were tried to read the Torah in certain meetings. that's just one example. There are many. There's a difference between illiteracy and not having books. Until the printing press was invented, books were rare. Then there's the issue of having a codified and recognized group of sacred texts. The Jews have long has the Torah, as you noted, which they used in worship and theology. My comment was focused on the early Christian church, which was rather illiterate (this was some of the debate around the Reformation and allowing the common people to even be able to read the Bible). Aside from that, it took several centuries before the canonized Bible was recognized and agreed upon. The Bible is not everything?? I am confused by this. It is because of the historicity of the Bible that provides one to have a faith. The Bible is our guide, our love letter if you will, from our God. It provides us with the example of which to live our lives by. The common saying, "What would Jesus do?" will only work if we have an example of Jesus to follow, and that comes from the Bible! Interesting and thought provoking conversation my brothers! I agree that the Bible is our love letter from our God and provides wonderful examples of how to live (and how NOT to live!). However, the Holy Spirit is really the one who provides faith and guidance. The Bible provides a context for understanding the Spirit's movements. But the Trinity is what we worship, not text. Got a question, struggle, or doubt you'd like to see addressed here? Contact me, and I'll try to discuss it (and may even help you get an answer). I am a Clinical Psychologist and have a passion for the integration of psychology and spirituality (my BA was in Religious Studies), particularly under the umbrella of spiritual formation. 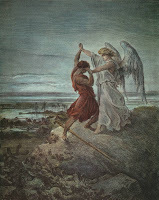 Jacob's Café was a group, but is now an electronic place to struggle with our faith and lives, using Jacob wrestling with God as a metaphor for our experience. The point of this place is to ask questions and seek answers, allowing the journey to deepen and enrich our lives and faith. © 2008-2016 Joshua P. Morgan. All rights reserved. Picture Window theme. Theme images by PeskyMonkey. Powered by Blogger.